Pay only $898 when you pay in full! QC’s Event & Wedding Planning Certification course provides students with the most comprehensive training available to succeed in the event industry. The course combines the Event Planning course and the Wedding Planning course, providing you with the practical skills and tools to start your own planning business or find a job in the event industry. Plan and organize milestone parties, weddings, industry special events, and more! You will graduate with an industry-recognized certification and designation so that you’re ready to launch a successful career in event and wedding planning. Upon graduation, you will receive your certification and be able to use the designation of International Event and Wedding Planning Professional (IEWP). Use the designation on your website, business card, contracts, and other marketing materials. 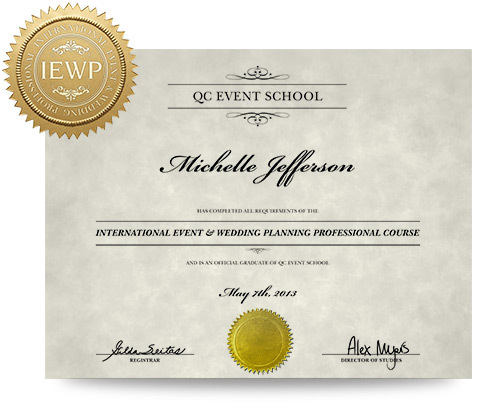 The IEWP Event & Wedding Planning certification is approved by the International Live Events Association and cements your credibility as an established industry professional. You will gain a competitive advantage over other planners in your local industry. Explore the ways in which you’ll create unique event concepts for your clients, focusing on various event components. Learn about the event planning time frame and process of organizing and prioritizing tasks. Discover how to work with clients to create an event budget, and learn strategies to keep your costs on track. Find out how to select appropriate venues based on client needs. Learn how to interview caterers and plan a menu with dietary restrictions and allergies in mind. Learn the planning process for children and teen parties, plus creative ways to celebrate milestone occasions. Assist clients with funeral arrangements for their loved ones, and study celebrations for religious rites. 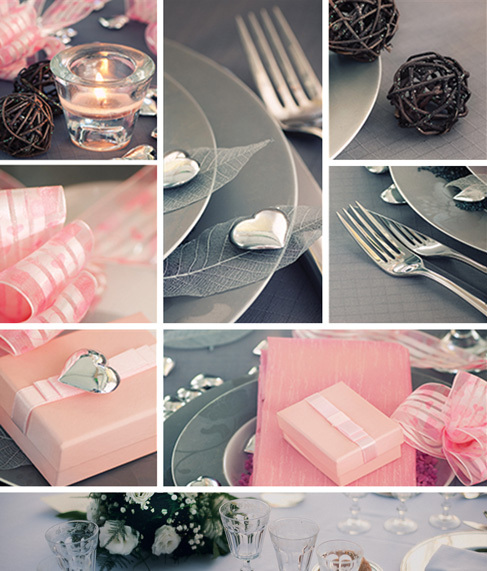 Discover planning differences for various events such as milestone, holiday, and themed parties. Learn the planning process for industry and special events, as well as for charities and community partners. Study strategies for risk management at events, and learn to create effective contingency plans. Explore types of insurance you need in order to protect yourself and your clients from potential risks. Learn about the wedding timeline and process of planning a wedding, step by step. Discover how to help your clients create an appropriate guest list, and select wedding stationery. Study proper wedding attire and aesthetics, including wedding dress styles and dressing the wedding party. Learn how to market and promote your event and wedding planning services. Explore strategies for networking with vendors, maintaining professional relationships, and working closely with clients. When you enroll, you will receive all the course materials you need to complete assignments and graduate from the course. Physical course guides and lesson texts will be sent to you. Meanwhile, you will gain access to electronic copies of your course materials through your Online Student Center. Here, you will also submit assignments, connect with peers, and review your personal tutor’s evaluation and audio feedback for your assignments. As a graduate of QC Event School, you will gain lifetime access to updated resources on the Student Center. 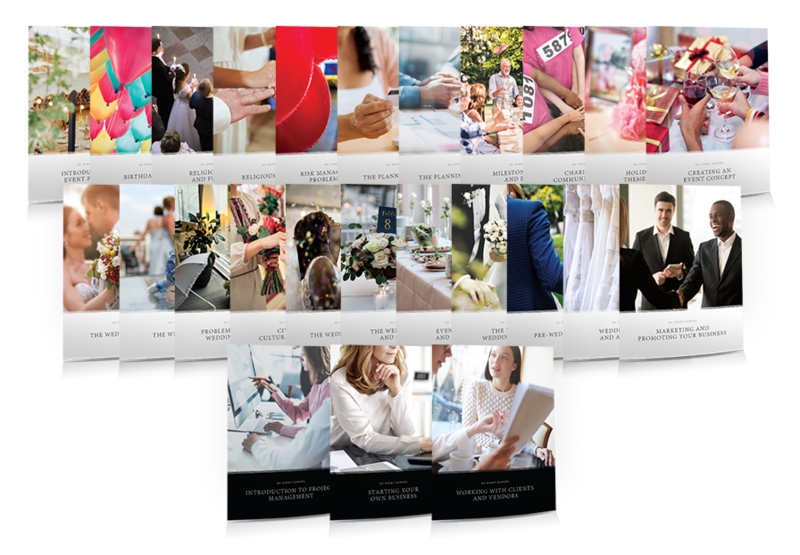 Download the Event and Wedding Planning Course Preview to get a sneak peek of the course. If you are great planning, love helping people achieve their goals, and enjoy meeting new people, a career in the event industry could be right for you. Enroll in the Event & Wedding Planning course today and take the first step towards a rewarding career. When you are a student of QC Event School, you are never alone. QC’s unparalleled Student Support Services will support you every step of the way to help you achieve your career goals faster. No problem! Check out our money-back guarantee.